Territorial and maritime disputes among Taiwan, China and several Southeast Asian countries are roiling the South China Sea region, with little prospect of resolution anytime soon. However, the current uneasy status quo may be tenable, so long as the parties embrace serious confidence-building measures through multilateral forums while maintaining effective deterrence vis-a-vis China and a commitment not to use offensive force. OSAKA – Territorial and maritime disputes among China, Taiwan, and several Southeast Asian countries are roiling the South China Sea region, with little prospect of resolution anytime soon. But the current uneasy status quo may be tenable, so long as the parties embrace serious confidence-building measures through multilateral forums while maintaining effective deterrence vis-à-vis China and a commitment not to use offensive force. Naturally, China is eager to exclude interference by extra-regional great powers, particularly the US, preferring bilateral negotiations with weaker regional claimants that it can more easily dominate. However, extra-regional powers cite the United Nations Convention on the Law of Sea — specifically, the freedom of navigation and the right of innocent passage — to justify their involvement. Given that the South China Sea disputes stem from overlapping claims to “exclusive economic zones,” not open ocean, the UN convention is not entirely relevant. 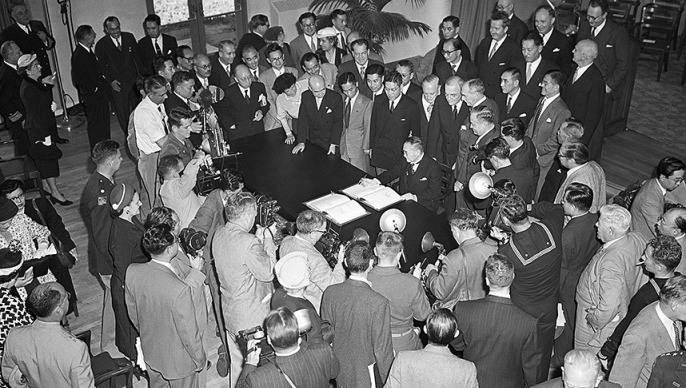 However, another international agreement does provide some guidance for settling these disputes: the San Francisco Peace Treaty, which entered into force in 1952 and officially ended World War II in the Asia-Pacific region. Under the treaty, Japan renounced its sovereignty claims over the Spratly Islands (Nansha Islands, 南沙群島) and the Paracel Islands (Xisha Islands, 西沙群島), but did not reassign them to any single country. As a result, these islands remain legally under the collective custody of the treaty’s 48 other parties — including two claimants to the islands, the Philippines and Vietnam. China — then in the third year of former Chinese leaders Mao Zedong’s (毛澤東) rule — was not even invited to participate in the peace conference. Although Mao’s communists had clearly won the civil war and secured control of China, the conference organizers disagreed about which government — Mao’s People’s Republic of China (PRC) in Beijing, or former president Chiang Kai-shek’s (蔣介石) Republic of China (ROC) in Taipei — truly represented China. As a result, the PRC denies that it is legally bound by the treaty. However, the treaty applies to the PRC indirectly through the ROC-Japan bilateral peace treaty of 1952, which was signed just hours before the San Francisco Treaty entered into effect and reaffirmed its terms — especially Japan’s renunciation of Taiwan. Indeed, the San Francisco Treaty required that the ROC-Japan treaty be consistent with it, thereby preventing Japan from assigning in its treaty with the ROC any additional right or title to any country other than the parties to the San Francisco Treaty. As a result, Japan is unable to recognize Taiwan as part of PRC sovereign territory. To be sure, the San Francisco Treaty per se is not legally binding for the PRC. However, for Japan, the PRC has clearly succeeded the ROC in Taiwan, as demonstrated by the 1972 Japan-PRC Joint Communique, on the basis of which the bilateral Treaty of Peace and Friendship was concluded six years later. When Japan shifted its diplomatic recognition from the ROC to the PRC, it recognized the latter as the “sole legal government of China.” Given that Japan was not recognizing China as a new state — international recognition of the Chinese state had existed without interruption since the ROC government emerged in 1912 — the PRC effectively accepted the rights and obligations of the previous government. Moreover, Japan did not recognize Taiwan as part of China, on the grounds that doing so would infringe on its obligations under the San Francisco Treaty. While Japan fully “understood” and “respected” the PRC’s declaration that Taiwan was an “inalienable” part of its territory, it did not recognize the claim in accordance with international law. The two countries simply agreed to disagree over Taiwan’s legal status. In other words, Japan renounced Taiwan without reassigning it. To date, China has been silent about the implications of the San Francisco Treaty for its claims in the South China Sea. This may simply reflect a dearth of international legal expertise in this field or the state of China’s segmented, stove-piped policy communities. However, it could also stem from concerns that using the treaty’s legal reasoning, which conflicts with China’s stance on Taiwan, to resolve today’s territorial disputes would undermine its credibility and weaken its position. If left unchecked, China may use the South China Sea disputes to gain effective hegemony over weaker claimants. All parties to the disputes, including China, can cite geographic and historical connections to the islands to back their claims, but none of them has solid legal title under the San Francisco Treaty. The US and other extra-regional powers should take advantage of this fact, invoking their latent collective custody of the Spratly and the Paracel islands in accordance with the San Francisco Treaty, and internationalize separate bilateral diplomatic processes between China and regional claimants. The treaty’s parties could even hold a conference to deliberate on the matter. Given that it would exclude China, such a discussion alone would be a game changer. Masahiro Matsumura is a professor of international politics at St. Andrew’s University (Momoyama Gakuin Daigaku) in Osaka, Japan.